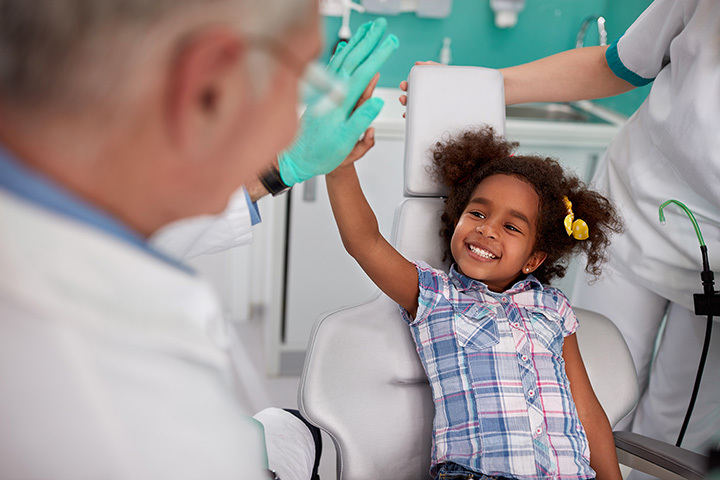 The 10 Best Kid-Friendly Dentists in Arizona! Let’s face it: going to the dentist is a pain. It can be a stress-filled experience for anyone, especially children. Kids would much rather spend their time eating candy than be lectured about flossing, brushing, and using mouthwash. Still, getting your kids to go to the dentist isn’t a lost cause. There are plenty of dental offices around Arizona that know how to put your kids at ease during their check-ups. Here are the best kid-friendly dentists in Arizona. Tatum Pediatric Dentist has a simple philosophy: Make dental visits fun for kids and easy for parents. Take one step into their Phoenix office and you’ll see that they live up to their word. The waiting room includes a decked out playhouse and iPads for kids to play with. Their dental chairs are covered in cartoons. Even parents can enjoy their flat screen TVs and free Wi-Fi. Tatum Pediatric also takes a conservative approach to dentistry geared towards prevention to make kids as comfortable as possible during treatment. It’s all smiles at Jungle Roots Children Dentistry. This Ahwatukee favorite looks more like a theme park than it does a dental office. The walls and décor are completely decked out to create a jungle-themed experience for the kids. In addition, kids can have their pick of toys, video games, and books to play with in the waiting room. Jungle Roots also benefits from the expertise of Dr. John Culp, Ahwatukee’s first pediatric dentist. Northwest Children’s Dentistry takes the term “kid-friendly” to a new level. This Tucson dental office specializes in treating kids ranging from toddlers through teenagers. They’re also an advocate of early treatment and help consult with parents about dental health for children as young as one-year-old. Each kid also gets a goodie bag loaded with fun prizes like stickers and tokens for their toy machines. What kid doesn’t like gifts? #SirMaxwell with his dentist flow. His teeth are in good shape! Children’s Dental Specialty Group is like something out of a kid’s dream. The walls are covered in fun paintings and the waiting room is filled with TVs and iPad stations. This pediatric dentistry is also known for having a fun and energetic staff that can help put your child at ease. They also use the latest in dental technology including digital x-ray and intra-oral cameras to make sure your kid gets the care they need. Don’t forget to grab a token for the prize dispenser on the way out. Your kids will feel right at home at Children’s Dental Village. This Tempe pediatric dentist is tailor made to make kids comfortable during their appointment. After walking through a “kid’s door,” the kids will have access to books, a fish tank, and even a playhouse. Exam rooms are designed with an open concept and with fun pictures to make kids feel at home. Each dentist is specifically trained in child development practices for extra special care. Your kid can travel the globe at Jet Set Smiles Pediatric Dentistry. This Phoenix dentistry belongs to Dr. Hiren Patel, who has lived in India, Africa, and England. His diverse past is on full display at the office, which has a jet set travel theme showcasing different areas of the world in each room. Kids can also enjoy watching a movie during their cleaning, spin a prize wheel after their appointment, and even ask for a balloon sword. Does your kid want to go to space camp? Desert Ridge Pediatric Dentist is the next best thing. The inside of this Scottsdale dental office is designed to look like a futuristic space ship. Kids can play with the controls and fun interactive displays while they wait for their appointment. Desert Ridge Pediatric pulls out all the stops to make your kid comfortable. Each kid gets a prize, goodie bag, balloon, and access to a TV during their cleaning. There’s no doubt that a trip to Southwest Kids Dentistry can be relaxing. Their laid-back vibe is on full display in their dental chairs, which are made out of converted surfboards. Kids are also given sunglasses to wear and movies to watch during their cleaning. This Tucson dental office uses every strategy to keep kids comfortable. They give patients blankets, memory-foam pillows, and even refuse to use overhead lights in their practice. ABC Dentistry for Children has been so successful that they now have three local offices in the Valley. This top-notch pediatric dentistry is filled with experts on preventative dental care for children. The office also has an iPad filled waiting room to keep kids entertained. Kids also get a prize and goodie bag for good oral health. Their mix of professionalism and fun has earned them many accolades as one of Arizona’s best pediatric dentists. Adults must be accompanied by children. That’s the rule at Wee Care Dental, a pediatric dentistry in Phoenix. The head dentist, Dr. Rick Meyers, has been a pediatric dentist for over 20 years and is an expert in cleanings, exams, fillings and extractions. Wee Care Dental also has a fun-filled waiting room and jungle theme that keep kids smiling all visit long.